Patti loves how, even as a grown adult, Flynn is still very playful. One of his nicknames is “Energizer Bunny” – even after running and playing hard at the dog park, he will bounce and grab at the leash. He also does it when he and Patti have finished their visits. 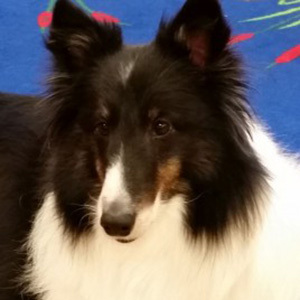 Patti says Flynn is a typical Sheltie in that he is very sound sensitive. At home, when anyone sneezes or blows their noses, he will bark. However, when Flynn is on a visit and someone sneezes, he doesn’t react at all. He knows when it’s work or play time. Flynn is especially drawn to kids, and the pair enjoys visiting as a R.E.A.D. (Reading Education Assistance Dogs) team. Patti & Flynn also do the Tails for Reading program at the Watertown and Norwood Young America libraries and participate in the annual Hooked on Books event. This is one busy team! As members of North Star Therapy Animals, they also volunteer at Christ Community Lutheran School where the first and second graders read to them. At Christmastime, the class wrote and illustrated a book for Patti & Flynn called “Adventure with Flynn”. They also visit the Ronald McDonald House. In addition, Flynn has been the “patient” for FutureVet presentations at the Minnesota Zoo and Minnesota Children’s Museum. When Flynn isn’t busy giving so much time to others, he loves to get out for walks on the Luce Line and Dakota Rail Regional trails with his sister Angel, a Border Collie/Lab cross. He loves going to the dog park where he can bark without getting in trouble and being able to really stretch his legs out. Flynn loves agility class as a break from working where he can run and jump and bark and play. At home, he keeps a watchful eye out for birds, squirrels, and loud cars and trucks.